September 7 2011, iPhone 5 rumored launch date! 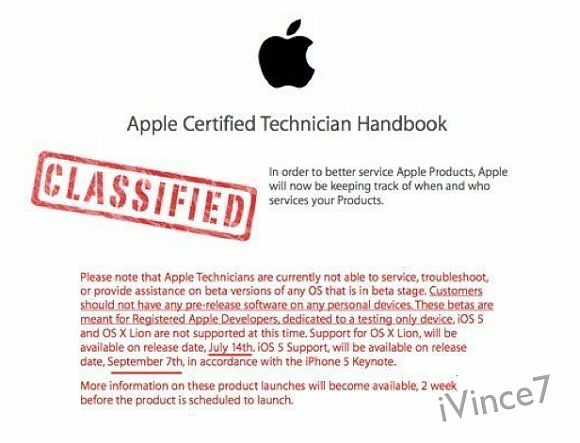 Based on the photo given by tipster iVince7, Mac OS X Lion will be available on July 14th 2011. This coincides with MacBook Air rumors. It has been rumored that MacBook Air refresh will be coming out somewhere mid July 2011. Another important thing is that iPhone 5 will be launched together with iOS 5 on September 7th 2011. This rumor has some weight as Steve Jobs have mentioned in WWDC that iOS 5 will be available somewhere September 2011. Well, no matter what the rumors say now, it’s rather confirmed that MacBook Air will be coming out somewhere middle of next month (July 2011) and iPhone 5 will be launching in September 2011. Again, my prediction for the launch date for iPhone 5 will be somewhere December 2010/January 2012 unless something changed. 🙂 I believe the launch date for iPhone 5 for Asian countries, like Singapore, Hong Kong, Taiwan, Thailand are almost the same except Japan, Australia and New Zealand (They usually get it the same time with US). Thanks, iVince7 for the tip! iPhone 5 launch rumored to be in September 2011? MacBook Air Refresh Coming in June/July 2011? iPhone 5 Will Be Launched in US on 12th September 2012 & List of Live Blogs!!! Next story Download AppShopper for iPad/iPad 2/iPhone/iPod Touch!!! Previous story Maxis extends RM799 Samsung Galaxy S II promotion in Penang!